Within walking distance of the Grand Cul de Sac lagoon, La Belle Epoque is a roomy one bedroom, one bathroom villa with great views of the sea. The home is situated in a private setting with tropical gardens and features a pool and deck for swimming and sunbathing. La Belle Epoque has an expansive living area and kitchen, as well as indoor and outdoor dining furniture. The bedroom with king bed is air-conditioned for your comfort. The beach is just a short walk away through the gardens of a nearby hotel. Restaurants and groceries are just 5 minutes away by car. La Belle Époque is a 1 bedroom, 1 bathroom villa. This tastefully decorated and private villa is ideal for honeymooners. The villa is surrounded by a tropical garden, a sunny deck, and a pool. 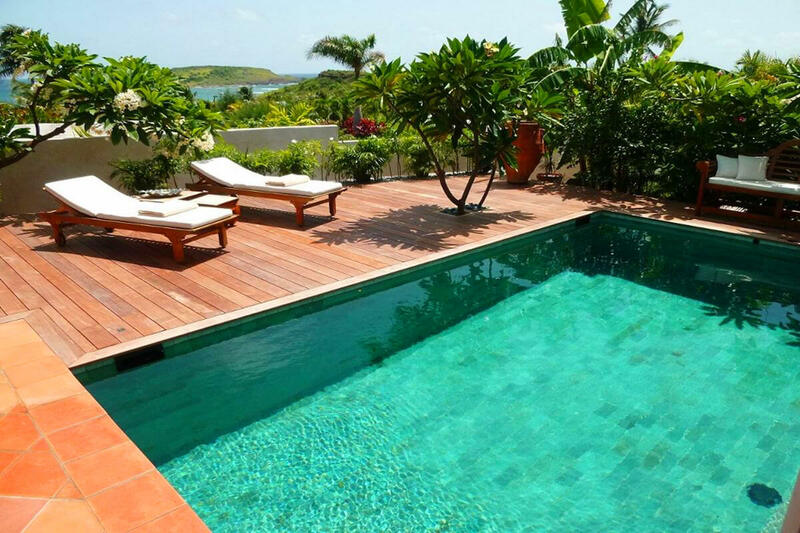 The home is located in Marigot at a walking distance from the Grand Cul de Sac lagoon and the beach of Maréchale. Public access to these beaches is through the garden of the hotel, Guanahani. La Belle Epoque is the perfect villa for a couple who wants to be close to a nice beach and restaurants. This villa excepts 10 nights during Christmas/New Years. Access to paid services of the Hotel Guanahani except for Fitness, Kid’s Club and room service.